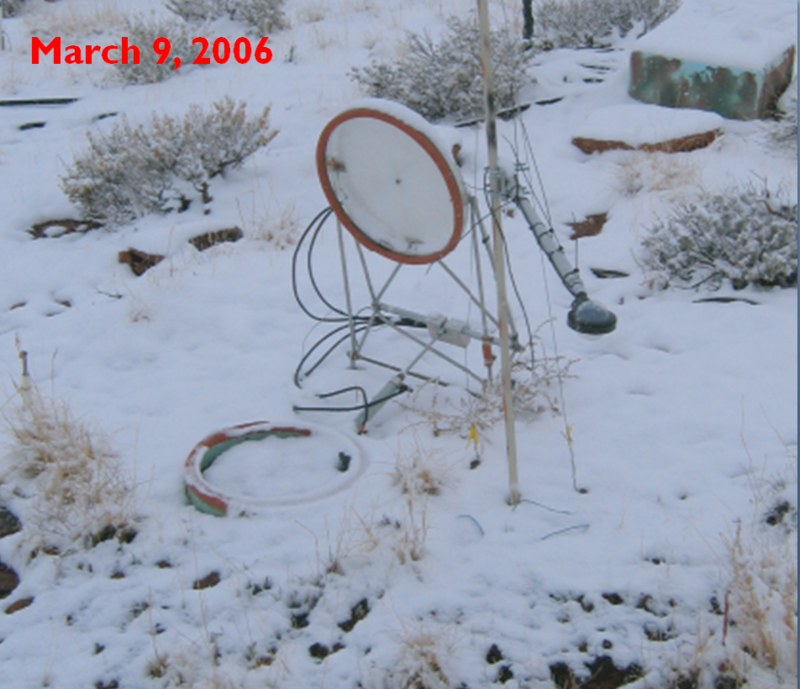 Just before starting my current position at UTEP, I was at USGS in Moab as a postdoc for about a year and a half. Most of that time was spent working on a fascinating data set that came from a large warming experiment set up in the red rock desert of southeast Utah at a site thick with gorgeous biological soil crusts (biocrusts). I was working with my postdoc advisers Dr. Sasha Reed and Dr. Jayne Belnap, who set up the project, as well as USGS scientist Ed Grote, who was crucial to the technical aspects of the operation for the entire length of the study. Here’s the paper, which came out in Biogeochemistry last week. The main purpose of the study was to examine the effect of the warming treatment on C exchange in these biological soil crust dominated soils. I think the findings for the crusts themselves was pretty clear. We saw that when they were active, that is when the soils were wet enough for the crusts to be photosynthesizing (~10% of the time), the warming treatment negatively affected the carbon balance (denoted as net soil exchange or ‘NSE’ here) in these soils. 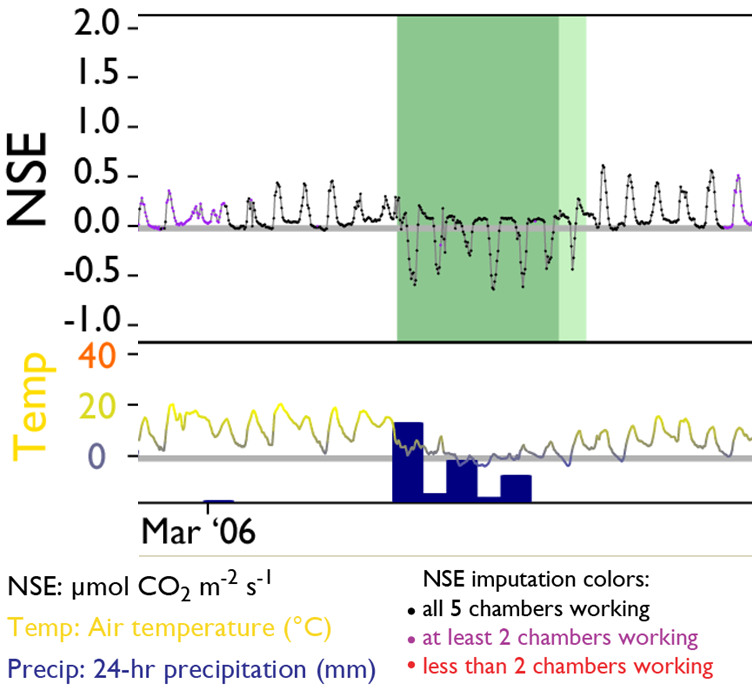 The warmed soils lost more or gained less carbon than the control soils. and here is a graphic I made for an associated presentation indicating the possible sources of CO2. The interesting thing to note here is that the soils are losing CO2 almost all of the time, which means that the CO2 source cannot come purely from the biocrusts (otherwise they would rapidly disappear from constantly losing C). 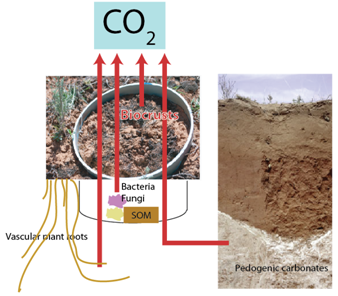 In the supplemental material, we discuss how we consider the likely sources aside from biocrusts to be (1) sub-crust microbes (2) vascular plant roots and (3) pedogenic carbonates, which would be an interesting inorganic source. My best current guess is that the carbonates are not a big contributor to the annual CO2 fluxes at this site, but honestly it hasn’t been thoroughly studied enough and I think there is a lot more to know about how this inorganic pool interacts with CO2 from plant roots and microbes. Deserts have a huge quantity of inorganic carbon and if even a fraction of it is being actively exchanged it could be a big deal. I want to take some biocrusts into the lab and prove that this occurring and explore the dynamics a bit more, but for now this is some intriguing evidence! The last contribution I want to mention about this paper is the gap-filling techniques that we employed. I used a super cool R package called missForest which iteratively fits random forest models to fill in all gaps in a data set. You can feed it any data frame and it will do its best to fill in the blanks. Its best can be surprisingly good, and I’ve been joking that I’m now very good at creating fake data. I found I got the most impressive results when I fed it three days worth of time lags on either end of the missing data point. The flux from yesterday at noon is a great predictor of the flux today or tomorrow at noon. This technique worked great for all of the smaller gaps, and is less good for larger gaps, but we were blessed with a relatively complete flux data set compared to many. That’s a testament to Ed and his team keeping the system up. Anyway, if you want more info on this technique, you can see the code for yourself in the supplement and I’d also be happy to answer questions.